This is a question many consider the same however they are very different things. To better understand the difference, we will discuss both as it relates to investing in Real Estate in this article. So, we’ll ask and answer the question, why are you investing in Real Estate? Let’s begin with the definition of both from dictionary.com, cash flow and wealth. 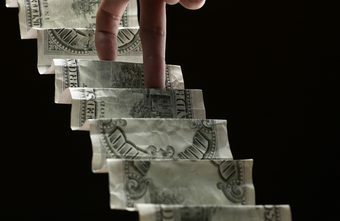 Cash Flow – the total amount of money being transferred into and out of a business, especially as affecting liquidity. Wealth – an abundance of valuable possessions or money. As you can see by the definitions above these are not the same thing. They are especially not the same thing as it relates to Real Estate. This seems to be one of the main reasons many people decide to invest in Real Estate. It’s an easy concept on the surface. There are many turnkey providers that can sell you properties either renovated and ready for a tenant or with a tenant already in place. This is also what is known as passive income investing. We’ve said it many times, there is no such thing as passive investing in Real Estate. It simply doesn’t exist. Real Estate is not a light switch that you can turn on and off when you need light. In this case, when you need money. Real Estate in any form takes work on a daily basis. Let’s take a look at the numbers to help you answer the question of why you are investing in Real Estate. To have liquidity investing in Real Estate the best way to achieve this is without a mortgage. It adds a monthly bill and drastically reduces your equity. Equity is the key ingredient to building wealth. Equity is the same as a saving account, a 401(k), etc. It’s there whenever you need or want it. You may have trading fees or banking fees associated with the account, but you don’t have an obligation to debt. The money and asset are completely yours in total. 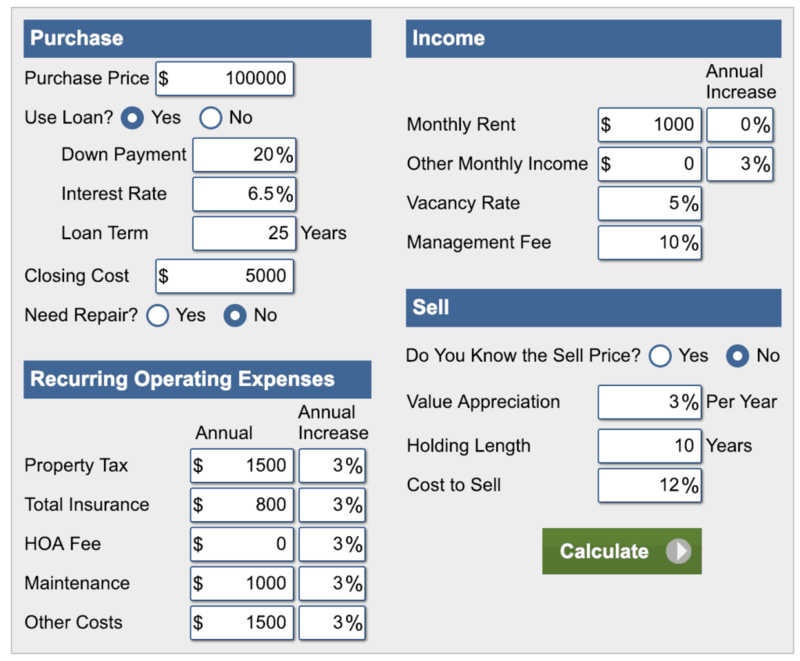 Below is an image of the actual calculations of owning a rental property without a mortgage. Note: Calculations do not include renovating prior to resell in the event of tenant turnover. It assumes the same tenant over the entire 10-year hold period. This never happens by the way. If one renovation within the 10-year hold period takes place your investment loses money on the resell, as calculated. All other calculations have been considered conservative with the best-case scenario. This is the approach many people take due to necessity. It’s difficult to build a portfolio with paying cash for properties that are $100,000 or more. In order to do this many lending institutions, require a 20% down payment. It seems as though it is the easiest way for many people to start investing. The easiest way to anything is never the best way. What many do not account for within the expenses is the interest paid over the term of the loan. Just because it’s an investment property doesn’t mean by the time you finish paying off the loan over the full term you won’t still pay 3 times the amount of the original purchase price. You most certainly will pay 3 times the interest. 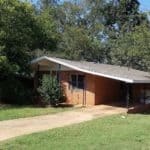 If you purchase a property for $100,000 but hold it for the 25-30-year term before paying it off, you are still paying $300,000 or more for the property. If you add this amount to the actual cost of owning an investment property you can easily spend 4 times the amount of the original purchase price. Even in the event you sell the property for $200,000 in 30 years you are still losing $200,000 on your investment. 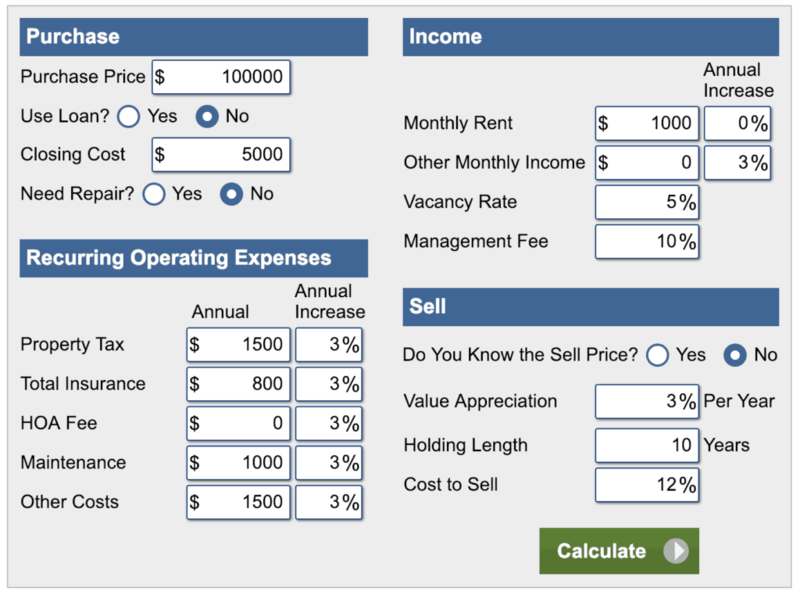 Below is an image of the actual calculation of owning a rental property with a mortgage. This is the part that scare many people and the reason they are never successful. It’s not enough to be happy with an extra $200 cash flow each month because you have added liabilities to yourself. The mortgage, taxes, and insurance still have to be paid even if the property is vacant. I know many will say that is why vacancy rate is considered with reserves. What happens if the economy turns downward and we get into a recession or a financial crisis? This happens every 4-8 years. It may not be a full-blown foreclosure crisis of 2009, but the markets do retract, and businesses cut back. Many times, those cut-backs are trickled down to employees losing their jobs. In order to build wealth, you have to plan for the future instead of believing everything will stay positive in the economy. The economy is volatile, and your livelihood is directly tied to the volatility of the economy. To build wealth you need to reduce your monthly expenses, both personal and business, in order to save money each month and/or invest the money you are saving in additional properties that make you money. This is where many will say the method is crazy, but it is far from it. There are some investments in Real Estate that are guaranteed. You could invest in a Fannie Mae security of loans. If you purchased a security your principle is 100% guaranteed. You may not make additional money from profit in the event every home in the security defaults. This never happens though. There are some that will default but you will make money every month from the remaining loan payments over the term of the loan. You could also invest in Section 8 housing. I know, you’re not buying in war zones. No one said you had to buy in a war zone. Section 8 is a federal program. 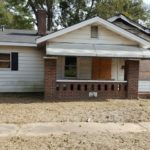 You could be approved by the Birmingham Housing Authority but rent a house in Hoover as a tenant. The only restriction of area is by county and state. If a tenant moves to a different county or state, the tenant has to transfer their voucher. By renting to a Section 8 tenant your rent is guaranteed for a year, every year. In the event of an economic downturn there will be more people that need assistance. This means there are more available tenants with the rent guarantee. This leads back to the lower income areas. It’s important to know the area or know someone in the area to look after your investment and guide you in the right direction on the right properties to purchase. 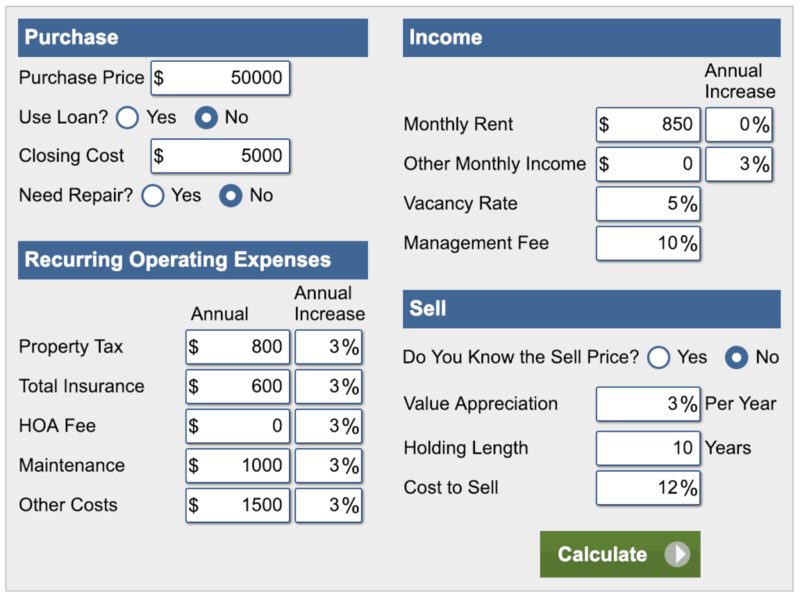 Below is an image of the actual calculation of owning a rental property in a lower income area. As you can see your cash on cash return skyrockets and you make just as much money with cash flow and resell as you do with higher priced investment homes. By investing in these areas, you do not need a mortgage because the houses will be priced for a similar amount of your down payment to buy with a mortgage. Instead of paying to play for 30 years you can now buy, renovate, and rent without adding additional expenses that you may not be able to pay one day. The expenses are only taxes, insurance, and management. The taxes and insurance are cheaper in these areas because it’s based on value. Instead of getting $1,000 rent and paying $800 a month in expenses to buy in the suburbs now you get $750-$1,000 and only have expenses of $300-$500. Your cash flow just doubled. The liquidity just increased because you don’t have the obligation of a mortgage to satisfy to sell. Your wealth increased since you have 100% equity in everything you own. This will increase your borrowing power if you ever need to finance due to have having a 100% debt-to-equity ratio. Every credit report includes the debt-to-equity ratio as part of the approval process. You read a lot about how people are building wealth and creating cash flow online buying Real Estate with a mortgage but it’s not the best or financially sound way to invest in Real Estate. If you are flipping a house and using a short-term loan it is beneficial since the cost of the interest and financial liability is minimal. When investing for the long-term the goal should always be reducing cost and increasing equity. The cash flow will follow. If you have high expenses, you can’t have adequate cash flow and definitely don’t have any equity. Investing is not buying for the appraised value. That’s what it’s worth not what you should pay for it. You are enriching others not yourself. It’s a service that some provide to people that don’t have experience in Real Estate. To be direct, it’s taking advantage of people and lacks professional standards of ethics. It shouldn’t matter that it’s easy. Remember, nothing in Real Estate that is easy is ever going to make you money. It requires work, due diligence, and knowledge. If you do not have it, you should invest in an annuity or CD. 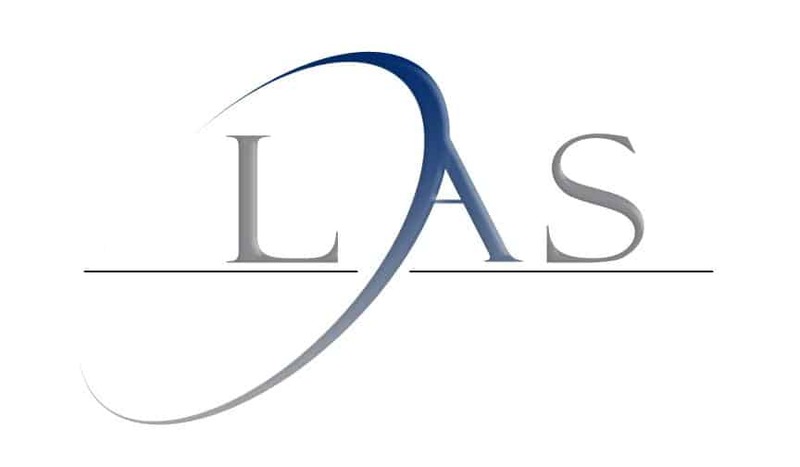 They are going to give you the same monthly cash flow without the liability or market volatility. Real Estate isn’t for everyone. If you are willing to put in the effort to learn and build your wealth, we welcome you to get in touch with LAS Companies. We only want to see investors succeed and will do everything we can within the law to make sure you are successful. Cash Flow or Wealth - To better understand the difference, we will discuss both as it relates to investing in Real Estate in this article. So, we’ll ask and answer the question, why are you investing in Real Estate?